WASHINGTON (CNS) — The link between respecting the environment and the sacramental life of the church is inseparable for one bishop overseeing a diocese that encompasses a collection of small islands in the South Pacific. Bishop Bernard Unabali of Bougainville, Papua New Guinea, considers the link so unfaltering that when he baptizes a new member of the church or confirms someone or even when he ordains a priest, he asks individuals to plant 10 trees as a way to give rise to new life. Such an act of faith, he told Catholic News Service Nov. 8, is one way he prayerfully encourages people to pursue to help stem the rapid pace of climate change. Bishop Unabali was in Washington to open a three-day symposium highlighting the urgent calls from Pope Benedict XVI on the importance of Catholics acting on behalf of an increasingly fragile environment in the face of climate change. The event, hosted by The Catholic University of America Nov. 8-10, brought together a dozen Catholic theologians and philosophers to discuss the implications of Pope Benedict’s biblically-based ecological vision for the Catholic Church, particularly in the United States. The symposium was sponsored by the U.S. Conference of Catholic Bishops, the Catholic Coalition on Climate Change, and the university and its Institute for Policy Research and Catholic Studies. Bishop Unabali explained that care for the environment and encouragement of sustainable development for Bougainville have become priorities under the pastoral plan he developed alongside lay parishioners. The plan, he said, is helping foster a greater awareness of the generations-long relationship with the environment that he believes each person is responsible for maintaining. Integrating Pope Benedict’s themes for the church’s Year of Faith, Bishop Unabali’s pastoral plan mixes Catholic and traditional spirituality with educational components that stress the responsibility each person has for stewardship of the earth. Bishop Unabali’s concern about the environment and climate change has taken shape throughout the 27 years of his priesthood. 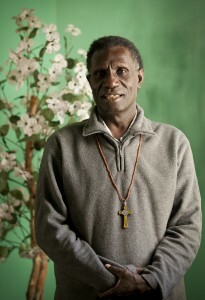 Named in 2009 to guide the Bougainville Diocese’s 160,000 Catholics after serving for three years as auxiliary bishop, the soft-spoken, slightly built prelate told CNS it was his visit to the Carteret Islands that spurred him to decisive action. Spending two weeks in 2007 with the Halia people who inhabit the atolls 50 miles north of the autonomous region’s main island, Bishop Unabali saw evidence of the rising ocean: One atoll had been cut in two, with the lowest areas under several feet of water. Hundreds of people were displaced. As many as 700 Halia have relocated in recent years to the main island of Bougainville, an autonomous region of 200,000 people in Papua New Guinea northeast of Australia. They are widely believed to the world’s first climate refugees. Despite their move, the Halia continue to struggle as the Papua New Guinea government offers minimal support. To help, the Bougainville Diocese has secured funding from a variety sources — some Catholic, but most not — to assist the Halia adjust to their new lives. The bishop said the 3,300 Halia remaining on the atolls are coping with their dwindling land, but that he expects within two or three decades all of the atolls’ residents will be forced to live elsewhere. Complicating the bishop’s concerns for the environment are underlying tensions that endure 15 years after the region’s nearly decade-long civil war ended. Almost since the day Papua New Guinea gained its independence in 1975, the people of Bougainville have sought independence for themselves. Frustrated by more than a century under German and Australian administration — interrupted only by a Japanese invasion during World War II — and exploitation of rich copper and gold reserves that yielded few benefits for local communities, Bougainville rebels began a fight for independence in 1988. It was three years after the war ended before a peace agreement was finalized in 2000. It led to the establishment of an autonomous government for the region and for a referendum at some point in the future on whether the region should become politically independent. Still, it’s a deep concern about climate change that guides Bishop Unabali’s work. He said he agreed to address the symposium to urge American Catholics to integrate biblical values of environmental justice into their lives. “We need to discover deeper symbols and meaning in those words (of Pope Benedict) and how to make them practical in our liturgy, our educational system, how we talk, think, speak, so it becomes part of our deep core Catholic values,” he said.